The Warrington Central Area regeneration masterplan project will produce a plan that will guide development, investment and projects in the central areas of the borough for the next 25-30 years. It is a real chance to shape the future of Central Warrington. The areas mainly covered by the masterplan are the wards of: Bewsey and Whitecross, Fairfield and Howley, Orford, Latchford East, Latchford West and Poplars and Hulme. Over the next 6 months there will be lots of ways that people who live or work in the area can get involved, have their say, design, prioritise and influence the ideas and projects that get taken forward into the future. The first round of engagement events and activities took place in November 2018 and there are a series of additional events taking place throughout March to provide feedback from the initial consultation. There is also an online survey, which can be accessed here. 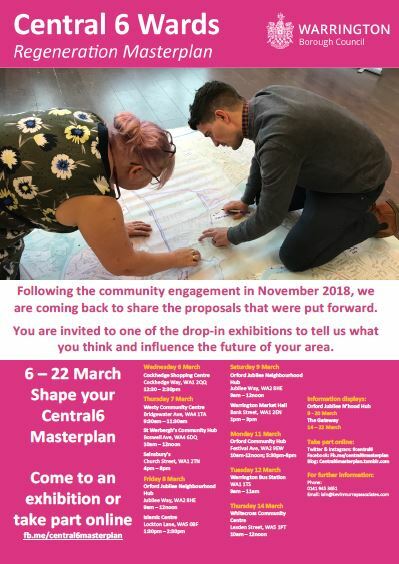 If you live or work in the central area, please consider attending one of the events, feeding back via the survey or linking with the Facebook page.